At the Medalta Potteries (in Medicine Hat, Alberta, Canada) during the 1920s they made stoneware crocks up to 60 gallons. These monsters weighed more than 200 pounds and had walls between one and two inches thick. These crocks were made from the same clays that are employed in Plainsman H550 functional stoneware today and the glaze was typical of the feldspar recipes we still use. 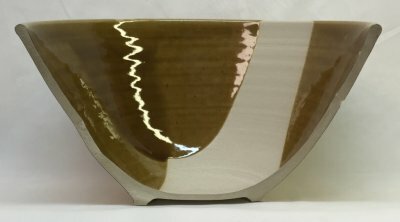 Even if you could fabricate one of these and figure out how on earth they dip-glazed a 250 pound unbisqued vessel, it would certainly crack into many pieces as it split during firing heat up and dunted during cooling. What was the firing secret? Simple. Energy was cheap, huge beehive kilns the size of a house could be fired for less than a dollar a month! Kilns were hard brick and massive and the firing cycle was one week. That's right, seven days. To me the moral of this story is that firing needs to be tuned to the ware. First, they use a body that employs low lignite, large particle, lower plasticity clays in the lowest possible proportion so water and gases can be vented out quickly. Second, they fire smarter. There are firing consultants in industry that do nothing but design custom firing curves for manufacturers. In the firing of any body there are periods when temperature rise can be much faster and others when it must be slower. But how much faster and where? A thermo-gravimetric analysis (TGA) test weighs a clay sample during firing to determine when it expels the most gases. A differential thermal analysis (DTA) test reveals the periods of firing where the body is exothermic and where it is endothermic. With this and other information one can design a firing curve that provides for the shortest possible firing time. Third, commercial kilns fire very evenly, some expose ware to less than a degree of gradient. Draft is one factor, many kilns have burners that double as blowers and create a kind of 'hurricane' within the kiln that exposes every part of ware to heat. A fourth factor is not directly related to cracking but I will mention it. Modern glazes are formulated to be fast-fire. They are low in boron and remain unmelted until just before the end of the firing. This makes allowance for easy channeling of gases of body decomposition before the glaze melts. How long should a firing be? If ware is cracking and you don't want to get into complicated analysis of your firing curve then it should just be longer, it is a relative thing. However it does not take brain surgeons to fire smarter also. Hold at boiling point as long as possible (over night candling is best) and go up (and especially down) through quartz inversion slower (1050F, 570C). In electric kilns there is no draft, this is a real problem in avoiding gradients; you have no choice but fire slower in the hopes of getting a more even firing. 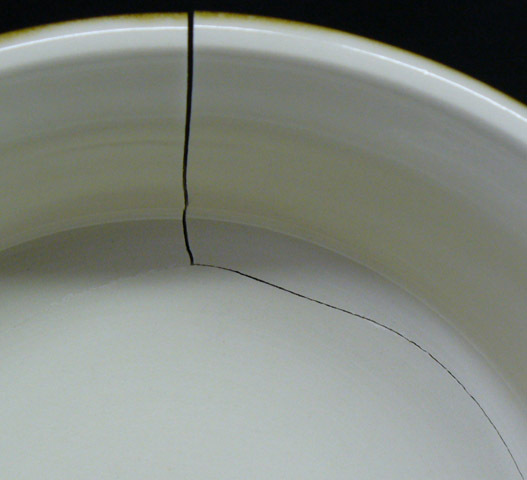 Example of dunting, where a crack has released the stresses produced by uneven thermal contraction during cool-down in the kiln. This usually happens by cooling too quickly through quartz inversion. Cracking during heatup. They start inward on the concave angles. It is important to create shapes not prone to cracking and smooth, compress and round abrupt contours and areas prone to cracks (to deny them a place to start). It started at a sharp angled indent on the outside (that coincided with a thin wall section) and grew around the perimeter (not visible). From there it branched to the base. This crack began as stresses created during uneven drying (the rim was allowed to get ahead of the base). 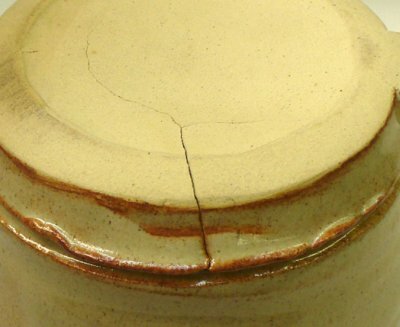 A thinner section (that happened during throwing) was exploited by the stresses and a crack appeared during heatup, likely during the bisque. The cross section of a bowl. 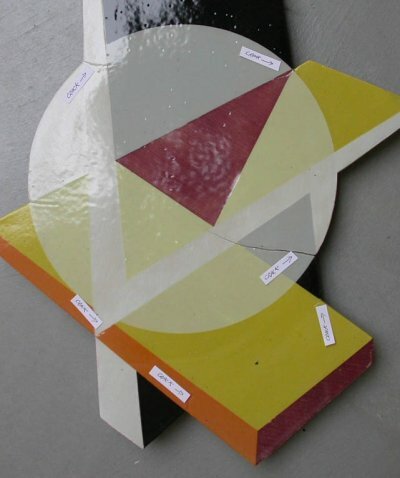 For the best success in drying and firing, it is advantageous to have as even of a thickness as possible. But it is also important not to have sharp concave angles. It would have been possible to make the section outside the foot ring thinner by creating a more abrupt concave contour, but that contour, if too sharp, could offer a point of weakness where a crack could start. For each trouble, link to appropriate tests. 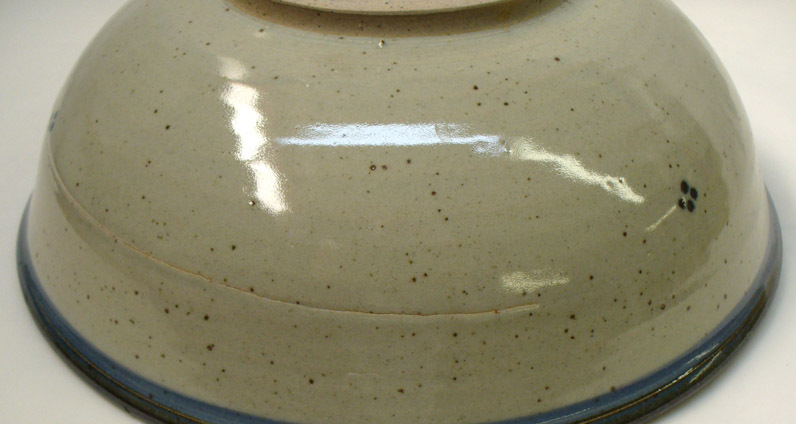 Ceramic industry can fire much faster and deal with much heavier objects than potters can, how do they do it. The answer is they pay more attention to the basics, it is all common sense and good equipment.